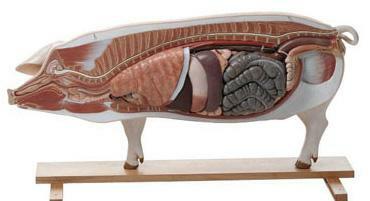 A model based on a breeding pig from the Bavarian State Institute for Animal Breeding in Grub. Approximately 1/2 natural size, in ‘SOMSO-Plast’. One side shows the skin, the other side shows the muscular system. The model is mounted on a base which can be pulled out and is detachable in two halves through the median line. After separating both halves of the body, the left side shows the thoracic and abdominal cover, while the right one shows the thoracic and abdominal organs. The left half of the head shows the muscular system, the main blood vessels and glands (the parotid gland can be removed) as well as the auricular cartilage and the left foreleg (both removable). The model separates altogether into 17 parts: the right and left halves of body, left half of head, parotid gland, left foreleg, half of lungs, heart (2), liver, stomach (2), pancreas, small intestine, large intestine, renal fat and half of uterus. H48 cm, W102 cm (length of the model), D26 cm,Wt 21 kg.